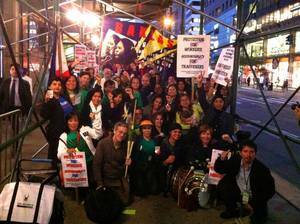 On Sept. 23, Damayan Migrant Workers Association and their allies in T’ruah, JFREJ (Jews for Racial and Economic Justice) and Women Organized to Resist and Defend (WORD) held a rally at Dag Hammarskjold Plaza in New York City to demand an end to the modern-day slavery of labor trafficking and to promote Damayan’s Baklas campaign. New York City is the home of the United Nations Headquarters and the second largest home to diplomatic missions in the United States, after Washington, D.C. Incidents of domestic worker trafficking by diplomats are appallingly common. After the rally, energized protesters proceeded to march along the streets chanting loudly “Free, free domestic workers, end, end the slavery” and “When workers’ rights are under attack, what do we do? Stand up, fight back!” Protesters made stops at the Mauritius and Tanzanian consulates, where domestic workers who were survivors of labor trafficking shared their stories. Each survivor talked about the inhumane working conditions they endured for little to no pay. They also talked about how they have become organizers in the struggle against labor trafficking. After each testimonial, the consulates were presented with an “F” grade for failing to hold diplomats and other government officials accountable. The event ended at the Philippine consulate with a candlelight interfaith vigil led by T’rauh and JFREJ, who expressed their deepest solidarity with the survivors of labor trafficking.